Lock in a great price for Aarau West Swiss Quality Hotel – rated 8.4 by recent guests! Breakfast was good, room modern and with view on the golf with a balcony.Try the veal cordon bleu at the restaurant.Fantastic! The bed it was very nice and comfortable. The breakfast it was limited. The staff was friendly and help full. Hotel room was good and as expected. Nice breakfast. Schöne Zimmer, freundliche Mitarbeiter an der Rezeption. Der Checkin auch am späteren Abend war völlig problemlos. Das Frühstück reichhaltig, leider kein frisches Obst. Der Kaffee lecker und in allen Varianten möglich. Parkplätze in genügender Zahl direkt vor der Tür. Grosszügiges Frühstücksbüffet mit Tischen auf der Terrasse. Aarau West Swiss Quality Hotel This rating is a reflection of how the property compares to the industry standard when it comes to price, facilities and services available. It's based on a self-evaluation by the property. Use this rating to help choose your stay! 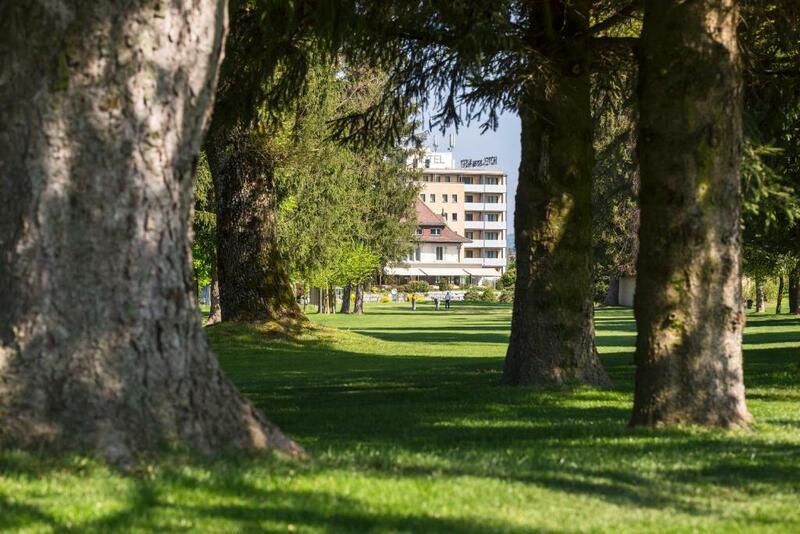 Located in Aarau, right next to a golf course and a large sports center, Swiss Q Hotel Aarau West offers an elegant restaurant with a terrace. The modern business hotel is conveniently located just off the main motorway A1 crossing Switzerland. All rooms were newly renovated in 2015 and come with a TV, a telephone and a private bathroom with shower and hairdryer. 3 conference rooms are offered at Swiss Q Hotel Aarau, and on request and at a surcharge, a fitness center, tennis and squash courts and a mini golf course are available. This property is also rated for the best value in Aarau! Guests are getting more for their money when compared to other properties in this city. When would you like to stay at Aarau West Swiss Quality Hotel? These newly renovated rooms are equipped with a TV, a telephone and a private bathroom with shower and hairdryer. House Rules Aarau West Swiss Quality Hotel takes special requests – add in the next step! One child from 13 to 16 years is charged CHF 30 per person per night in an extra bed. Aarau West Swiss Quality Hotel accepts these cards and reserves the right to temporarily hold an amount prior to arrival. Everything about this hotel was terrible. From the moment we walked into the room through breakfast the next morning. We entered the room and it smelled of rotten eggs we found was coming up through the drain in the bathroom. We travelled a long way and arrived late at night so we didn't want to have to change rooms but the smell was very bad. The front desk person moved us without an apology for the inconvenience. The hotel was empty of people so we were surprised our room was located on the side where one can hear the most traffic coming from the freeway. In the morning we wanted to make coffee but noticed the cups were dirty and there was water leftover in the coffee maker from the last use. We walked over for a complimentary breakfast next to the golf course and noticed lots of dog/animal droppings in an open area next to the restaurant. It didn't look like this area had been attended to in awhile. Breakfast was sparse and looked like it was left-over from a week ago. We were the only ones in the restaurant so most likely not enough people to keep things fresh. We went back to our room and noticed someone else's trash on the floor. The cleaning person must have inadvertently brought someone else's trash in our room. We booked this hotel for two nights but left after only one night. This hotel is nothing like it is advertised and I would not recommend it to anyone. It wasn't clear for me that daughter (11) is for free but breakfast is calculated extra for her. Small amount regarding total price, but with other hotels I normally have free breakfast as free breakfast for all persons I reserve. Reservations with children is often confusing in booking.com for me thus maybe it was not fault of the hotel. There was air conditioning (rare in Switzerland), but unfortunately it is centralized so could not control it in the room. No AC in the room, outside noise from the building, close to the tramway railway, no breakfast for early wake up. Poor breakfast, nothing hot to eat. Please note the hotel is located right next to a provincial road and busy at times. Also right next to tramline.